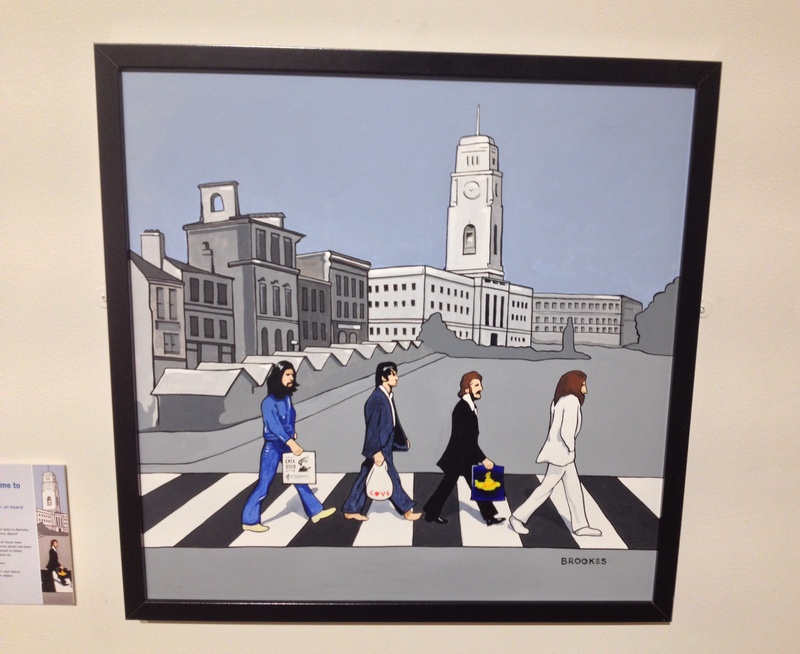 Saturday the 10th of January marked the opening of Barnsley pop artist Terry Brooke’s ‘When the Beatles came to Barnsley’ exhibition at the Experience Barnsley Museum! Last week, his display of work was very carefully hung by three members of staff with a collective twenty-five years plus experience between them which must’ve gone a long way to reassure Terry and his family that his first ever publicly aired pieces would be in safe hands. I first became aware of Terry’s work around spring time last year when I stumbled across his Facebook page BrookesART via my friend Michael Hardy. The first illustration I saw depicted a punk rocker stood outside former Barnsley record shop Casa Disco which instantly stuck a chord with me. As a former record collector it evoked warm and fuzzy memories of my own shopping experiences as a teenager at the shop, flipping through the racks of CD’s and vinyl and begging shop assistant Nigel Scarfe to save me the promotional cardboard cut-outs used to help promote a new release. 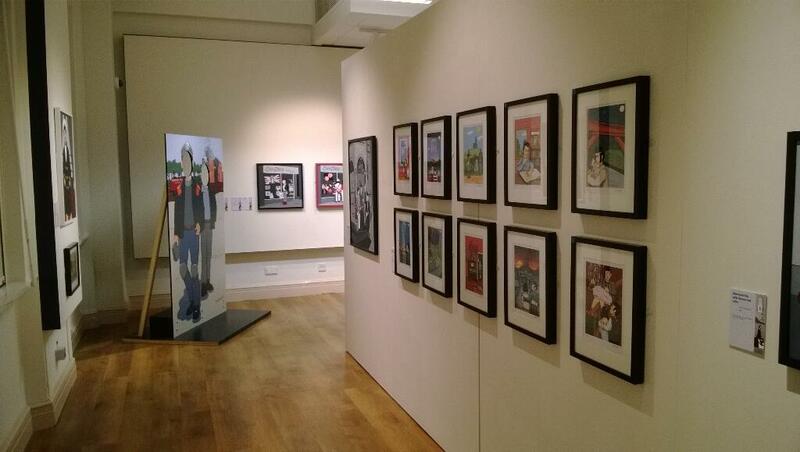 Just before Christmas, Terry teamed up with local comedy band The Bar Steward Sons of Val Doonican to produce a drawing of the band (along with Val Doonican himself) as a spoof of his own piece ‘When the Beatles came to Barnsley’, which is the centre-piece of this current exhibition. This added extra was given to ‘Doonifans’ as an added extra to say thanks to the fans who pledged money to have their ‘Bestest Bits’ album pressed on vinyl. I am the proud owner of number 64 out of 300. On his website, Terry states that he is proud of his working class heritage and BROOKESart celebrates the humorous side of every day urban existence: from the first cup of tea in the moo, walking the dog on a wet weekend and the British summer beach holiday. 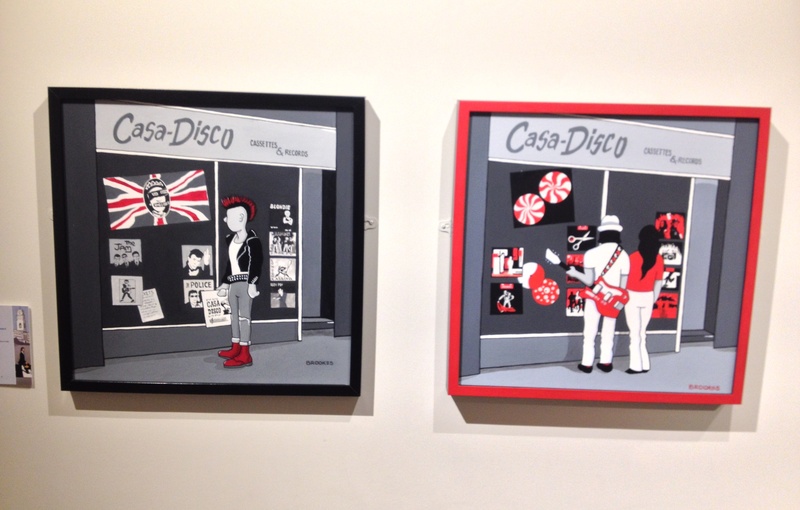 Terry’s love of music however, runs deep throughout much of his work and this exhibition fuses famous icons of past and present popular music with the iconography and landmarks of Barnsley. 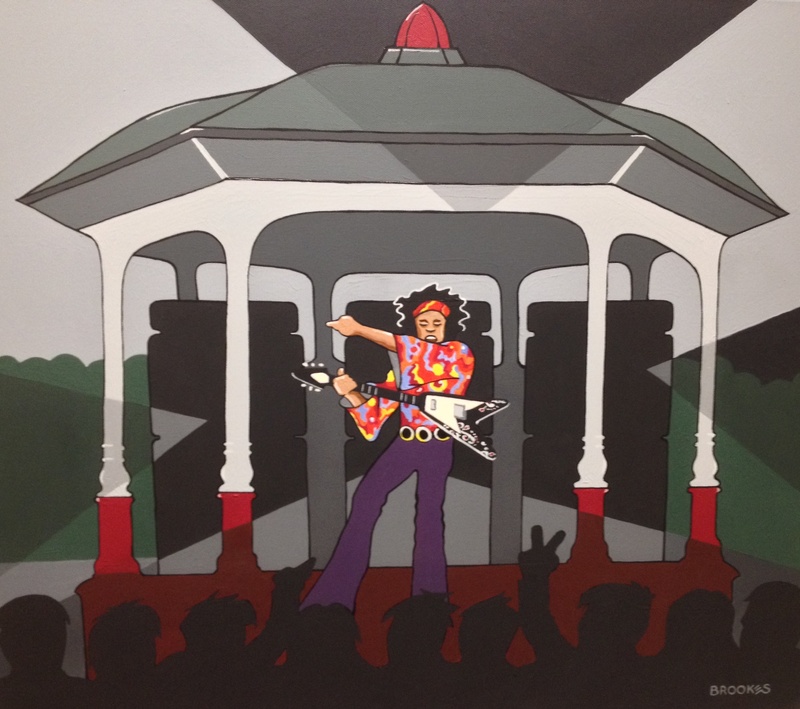 In once piece you can see Jimi Hendrix wowing a crowd in Locke Park; playing in the band stand. One can imagine him playing Star Spangled Banner for the very first time like he did at Woodstock in 1969. 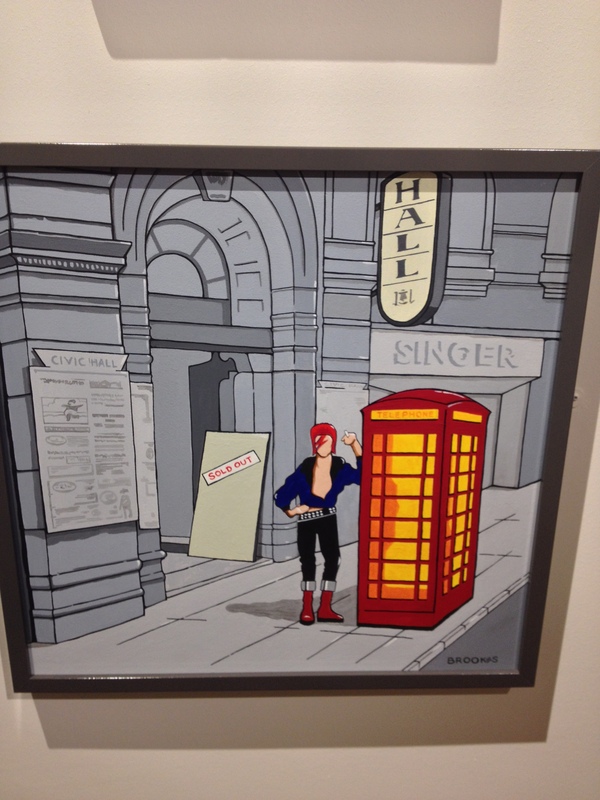 In another, Ziggy Stardust (David Bowie) is depicted leaning on a telephone box having a smoke outside The Civic. Now that would’ve caused a stir if he had really played there in 1970’s Barnsley! 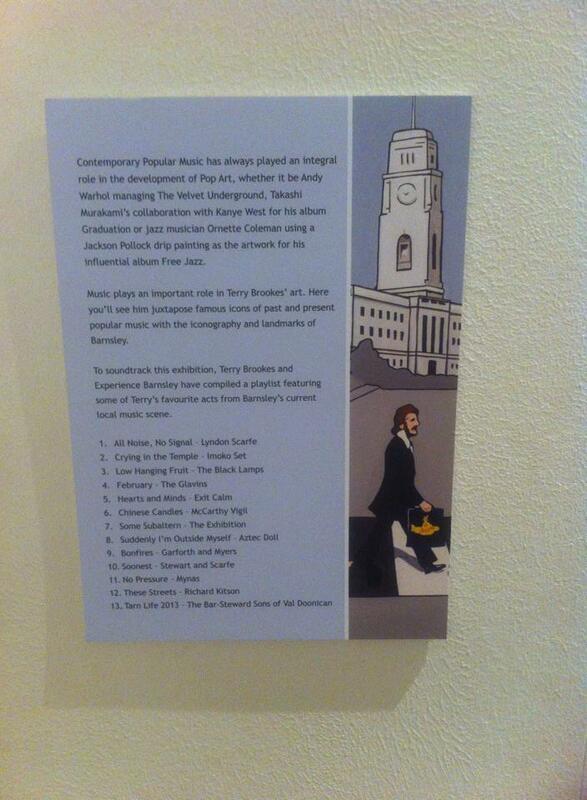 Could you imagine The Beatles’ Yellow Submarine washed up in the new fountains of Barnsley Pal’s Centenary Square? A Chronicle headline grabber for sure! 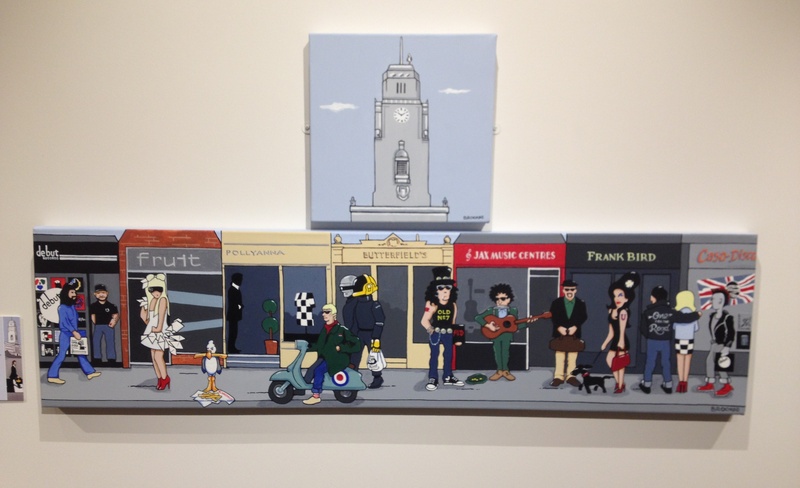 Also included in the exhibition are ten illustrations of various scenes captured in The Smiths songs, whereby Terry invites the viewer to ‘guess the lyric’. And, yes, answers are mounted within the vicinity if you can’t quite remember them. The illustration I was most fond of was the one of some of Barnsley’s well known shop fronts and various characters: rock/pops stars, mods, rockers and punks all hanging around outside them. I was delighted to see Stu Sheard propping up the doorway of his shop, Debut Records, down the arcade looking forwards as George Harrison nonchalantly walks past. Most of the illustrations in this exhibition are for sale (between £60 and £400) and if I had the money to buy one it’d definitely be this and would most probably display it on the wall in Debut Records (if Stu would let me!) to ensure it would be kept in the public’s view for years to come. The icing on the cake for me is the inclusion of a musical soundtrack to accompany the exhibition. Terry and Experience Barnsley compiled a thirteen track playlist featuring some of Terry’s favourite acts from Barnsley’s current local scene including The Bar Steward Sons of Val Doonican, Black Lamps, Exit Calm, Mynas and Imoko Set. As a local gig goer myself I was already familiar with all of the tracks but I thought it was a wonderful idea to use this as an extension of the exhibition to showcase some of Barnsley’s wonderful rich and varied musical talent (largely undiscovered!) to local people outside of the confines of local pubs and venues. ‘When the Beatles came to Barnsley’ will appeal to people of all ages – kids will love the bright colours and music fans from teens upwards will appreciate the many musical references and warm humour. Terry says that amongst his work ‘there’s always something to make you smile’ and this is very true but what I like most about this exhibition (and indeed the rest of Terry’s work) is that ordinary Barnsley folk can appreciate and identify with it very strongly as it’s so accessible, even if they know nothing about pop art or art in general (rusty comb anyone?). I think this will be key to the success of the exhibition. I’m hoping it will inspire other ordinary tarn folk to perhaps pick up a paintbrush, find out about the bands Terry has portrayed in his illustrations and to check out our local bands and musicians. After all, our local pubs and venues also need the support of our people!